The first thing my kids want to do is use the stickers. 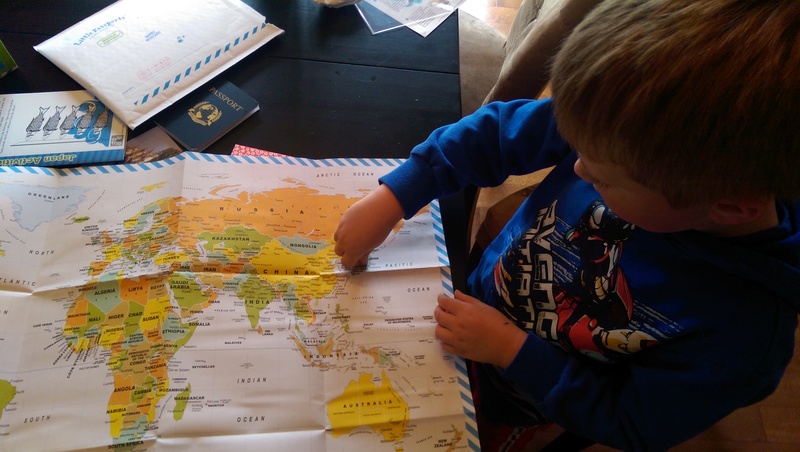 They love the fact that you get to put one in the passport, one on their suit case and then find the country on our world map for the “push pin” sticker. Finding Japan on the map! 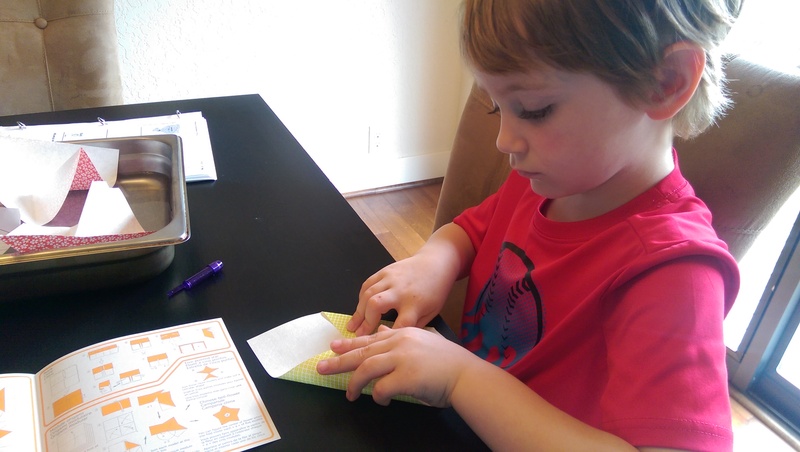 Both my 5 year old and my 7 year old loved the origami! They both chose to make the boat. One of the tips in the booklet was to color the bottom of the boat with a wax crayon so that it could float better. This created a great discussion about water repellant materials and we did an experiment on which boats would hold up longer, the ones with the wax crayon on the bottom and the ones without! Testing the first boat with the wax crayon coating. 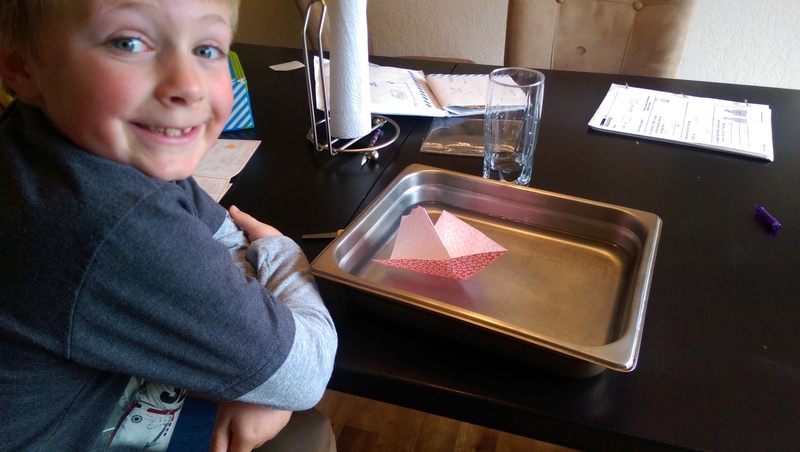 Making more origami while the test boats float. One of the other crafts in this month’s booklet was making a carp (koi fish) kite like they hang for Children’s day in Japan. 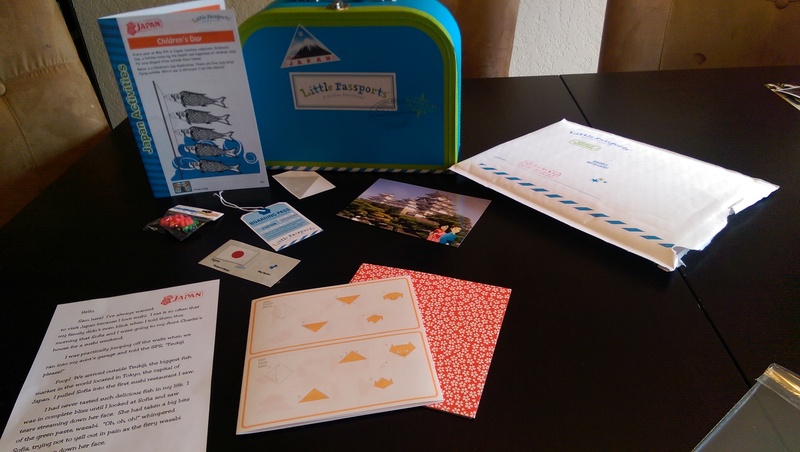 While we didn’t end up doing this yet, we talked about the custom in Japan to celebrate them and how parents wish health and good fortune and success. 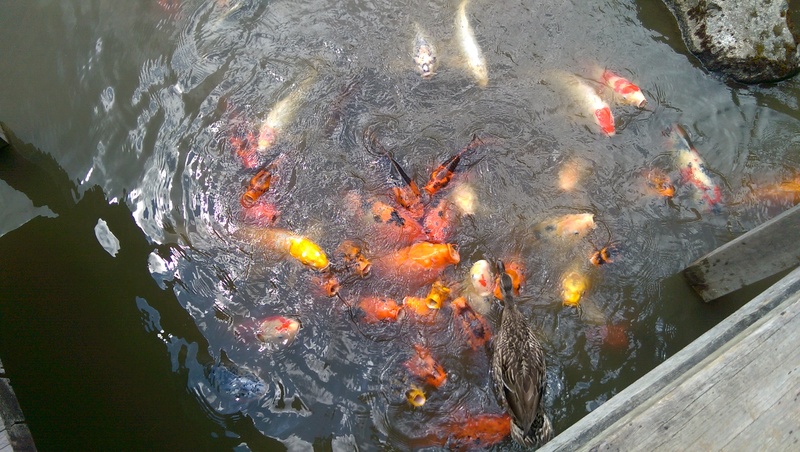 We also took a trip to our city’s Japanese Garden where they had several koi fish in their pond that we got to feed. Their mouths were so big and round that the kids saw the similarities of the circular mouths of the kites. Carp (Koi) fish at Seattle’s Japanese Garden. One of the biggest concerns we have as parents when traveling with kids is finding food that they will eat. 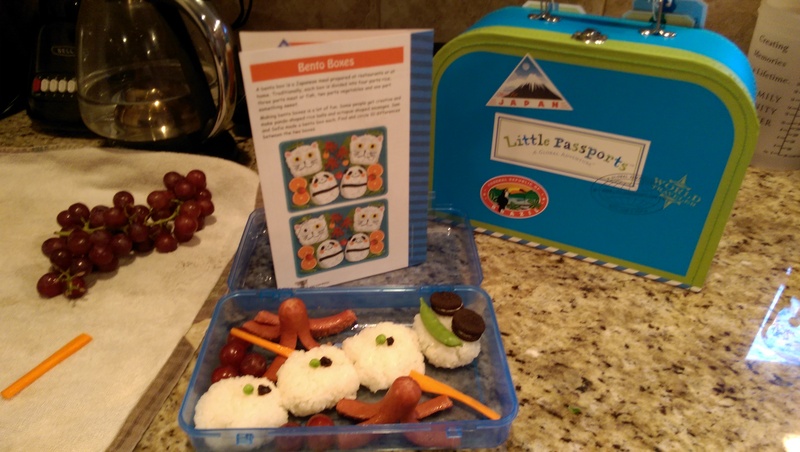 Our Little Passports Japan activity booklet talked about Bento Boxes and what kids will often eat during the day in Japan. 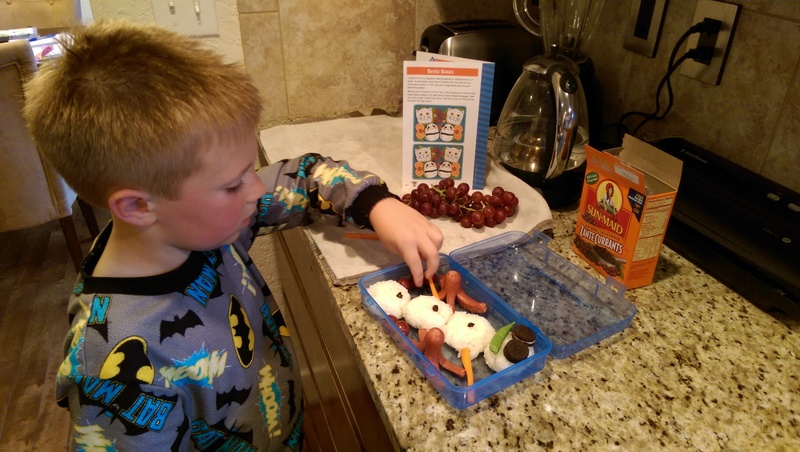 My oldest son is really curious about cooking and making food these days so this was a perfect activity for him! 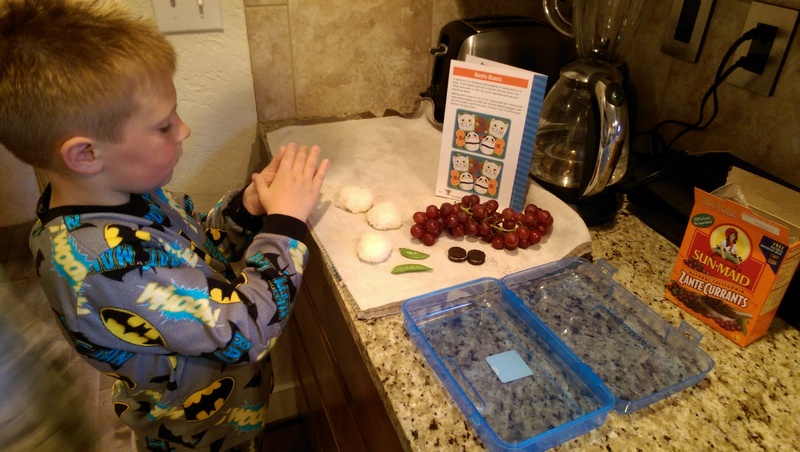 We made traditional sushi rice and let him choose things to add according to the ratios that we read about for bento box typical content. 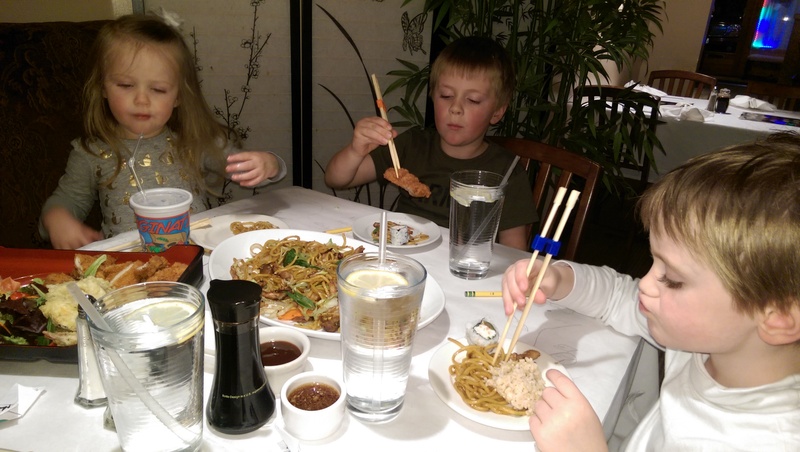 After testing out some Japanese food at home, it was time to take the kids to a local Japanese restaurant where we ordered a bento box and some sushi! It was a relief to see them so excited for food they wouldn’t normally touch because they had already experimented with it at home. I hope that this will make it easier for us to eat on our trip in Japan too!!! Trying a bento meal and yakisoba noodles at a local restaurant in our town. We also used one of the online interactive programs through the Little Passports Boarding Zone to get an idea of what cool things there are to see in different parts of the country which helped us highlight some of the “not to miss” areas that we will visit by train once we’re there. I think we’re ready for our vacation in Japan! Sayoonara for now!